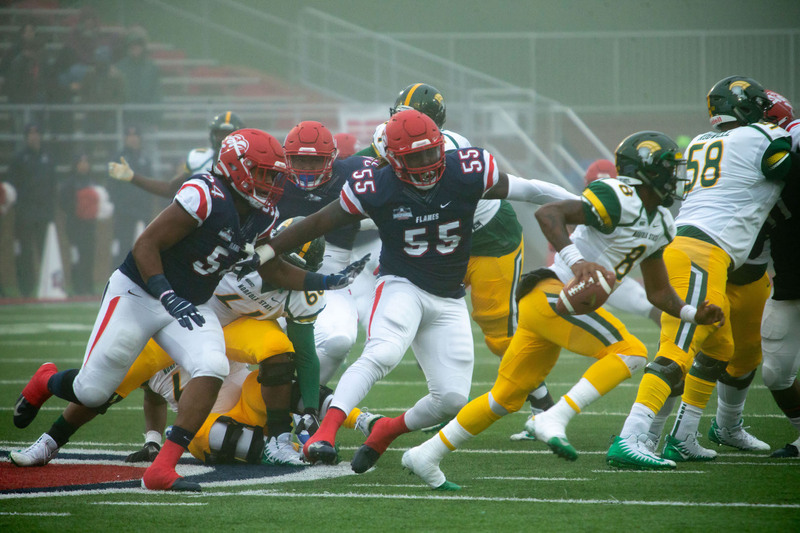 The Liberty University Flames football team celebrated senior day and its final home game of the season with a 52-17 win over the Norfolk State University Spartans Saturday, Dec. 1. Originally scheduled to take place Saturday, Sept. 15, the game was rescheduled due to the threat of Hurricane Florence in September. The win also marked the end of Liberty’s inaugural FBS season and brought their season record to a positive 6-6. The Flames honored 17 seniors at the beginning of the game, including wide receivers BJ Farrow and Damian King, running back Kentory Matthews and cornerback Jeremy Peters. SNATCHED — Senior cornerback Jeremy Peters caught an interception with a cast on his right hand. Liberty also honored five new members of the 2018 Hall of Fame Class, including Danielle McNamey Detmer (track & field) and Rashad Jennings (football). The inductees were given awards in the 2018 Hall of Fame banquet Friday evening. The Flames played one of their best games of the season, despite persistent fog and a temperature below 45 degrees. The team and its fans were blessed with mostly dry weather as the afternoon’s forecasted rain held off until it became a slow drizzle at the end of the night. The weather also did not prevent the fans from coming out, as the game boasted an attendance of 13,243, according to the Liberty News Service. Williams Stadium averaged an attendance of 16,282 this season, more than 1,000 people over the FBS’s minimum requirement of an average 15,000 fans. The Flames opened the game with a 76-yard drive that ended in a field goal kicked in by redshirt junior punter Aaron Peart. The Spartans responded with a field goal of their own on the next drive, bringing the score up to 3-3 halfway through the first quarter. Liberty continued to plow forward on its next drive and found the end zone on a pass from junior quarterback Buckshot Calvert to sophomore fullback Michael Bollinger. The touchdown catch was Bollinger’s first career reception as well as his first career touchdown. 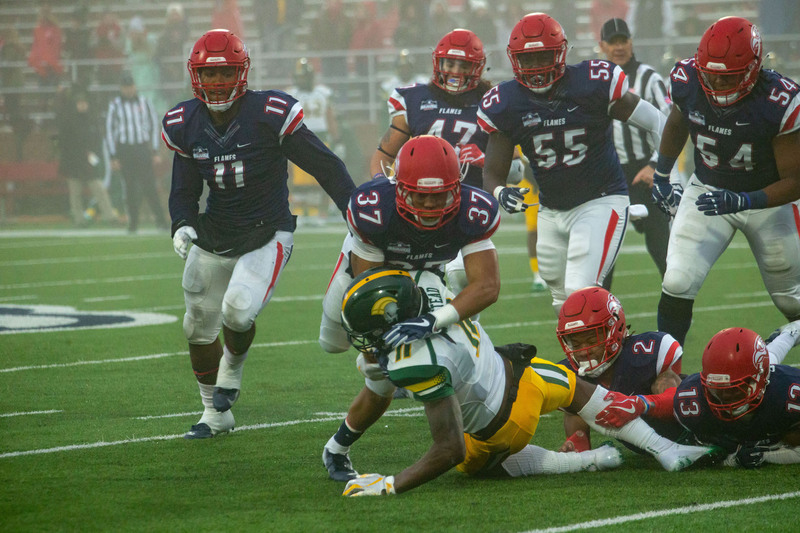 The offense barely had time to catch their breath after the touchdown when Norfolk State receiver Gerald Hulett fumbled the ball on the kickoff return, which was snatched up by Liberty redshirt freshman spur Aaron Pierre. Liberty opened the second quarter with a 5-yard rushing touchdown from junior running back Frankie Hickson. The team’s lead extended to 17-3 on another successful Peart extra point. Norfolk State failed to gain any yards on their next drive and were forced to punt from the 22-yard line. PURSUIT — Senior Tolen Avery closes in on the Norfolk State quarterback. Liberty refused to give up its momentum, pushing the team into high gear when Matthews broke through the Spartans line and sprinted downfield for 43 yards, putting the Flames on the Spartan 17-yard line. Matthews forced his way into the end zone a couple of plays later, diving over the Spartan line and into the end zone. Peart’s extra point brought the score to 24-3. Both teams stalled for the next two drives, neither gaining any serious yardage. Liberty broke loose after its punt, however, when freshman cornerback Javon Scruggs recovered the ball after another Spartan fumble. The tension between the teams rose a few minutes later when a scuffle broke out near the Liberty bench between players from both teams. The Flames took the ball home on another Matthews rushing touchdown, bringing the score to 31-3 with three minutes left in the half. Norfolk State failed yet again to put any points on the board when redshirt junior safety Rion Davis picked off a pass and dodged between the Spartans for Liberty’s fifth touchdown. The Spartans finally pulled their offense together at the end of the half and chalked up their first touchdown of the game on a ten-yard pass to receiver Justin Smith. The second half kicked off after a final halftime performance from the Spirit of the Mountain Marching Band, with Norfolk State receiving the kickoff. The Spartans very quickly gave the ball up again when quarterback Juwan Carter was sacked for a loss of ten yards on third down. The Flames plowed forward after Peters grabbed Carter’s second interception. The drive ended in a sixth touchdown for the Flames, carried in by Matthews. POUNCE — Freshman Amarii Jenkins tackles a Norfolk State receiver. Norfolk State refused to give up, however, and clawed its way into the end zone for a second touchdown. Kicker Josh Nardone’s successful extra point brought the score to 45-17. The touchdown was their last scoring play of the game. Matthews helped the Flames earn their last touchdown of the game on the next drive, earning his fourth touchdown of the game. The Flames wrapped up their season with a 6-6 record at the end of the game, as well as several stellar finishes from Calvert, junior receiver Antonio Gandy-Golden, and Hickson. Calvert became Liberty’s all-time touchdown leader with 65 career touchdown passes with his completed pass to Bollinger in the fourth quarter. 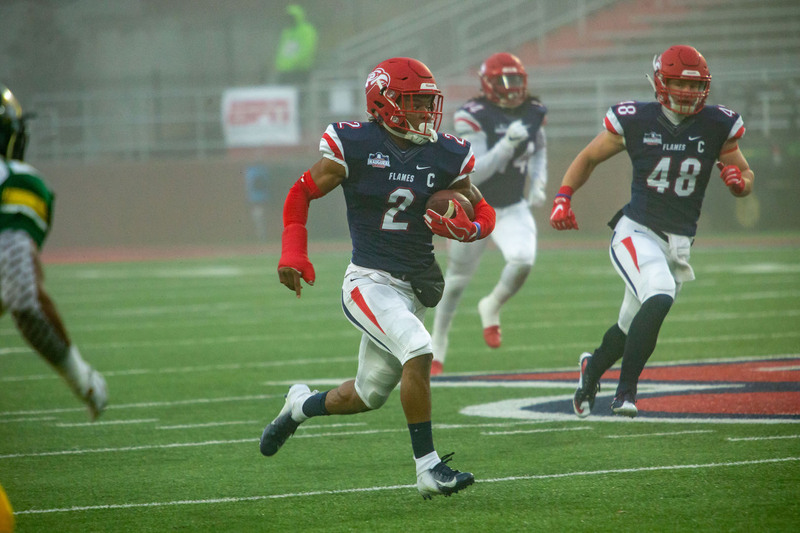 Gandy-Golden became the second-wide receiver in school history to post two consecutive 1,000-yard seasons, and Hickson earned a total of 1,032 yards to earn the 15th 1,000-yard rushing season in Liberty’s history. Liberty’s start was one of the better inaugural FBS seasons, becoming the ninth team in NCAA history to win six or more games during its first season at the FBS level.